At either 15, 20 or 30 Amps, 19" rack-mount or zero-U form factor, Rackit's power distribution units (PDUs) provide ample power outlets to support densely populated racks and are available in various mounting styles. Rackit's high performance rack mount surge protector PDUs offer a wide range of solutions for communication closets, IT equipment racks and cabinet applications. By dissipating and diverting excess voltage, Rackit surge protection units keep your critical systems functioning properly, providing advanced protection for critical computer, electronic and communications equipment. With 6 or 8 outlets per PDU, facing either the front or the back, Rackit's rack-mount PDUs fit standard 19" racks. With a 1U form factor (only 1¾" high) Rackit's rack-mount PDUs get rack-mounted onto server racks, Relay racks, wall-mount racks or any Telco rack conforming to 19" EIA rack-mount standard. Rackit's Zero-U (vertical) PDU surge protectors offer comprehensive power distribution solutions for IT environments from networking solutions to high density servers. Offering advanced protection for critical electronic and communications equipment, Rackit's Zero-U PDU surge protectors provide an elegant solution where reliable high-density power distribution for IT equipment racks, communication closets, cabinets, and enclosures is required. Rackit's Zero-U Open-Rack PDUs are identical to Zero-U (vertical) PDUs except that they ship with additional hardware that allow seamless integration into open-frame racks such as telco/relay racks and Servit 4-post racks, providing centralized, well organized means of locally distributing power to equipment mounted on the rack. These integrated PDUs ship with two (2) brackets that provide the ability to easily attach the PDU to the rack's upright mounting rail, thus occupying no rack-mounting space in the rack. 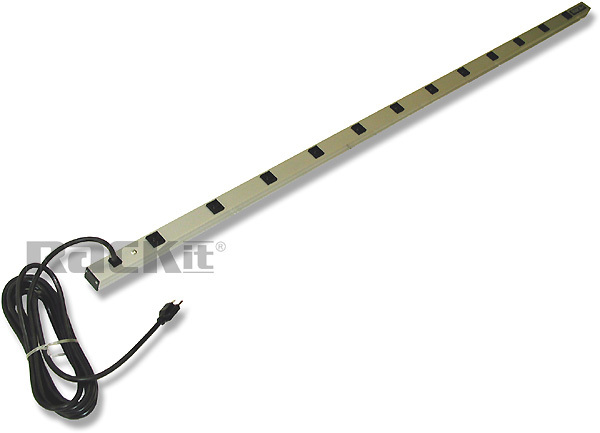 When integrating with Servit rack, Rackit's Zero-U Open-Rack PDU gets mounted onto the side of anyone of Servit's four uprights, with the outlets facing either the front of the rack (as shown) or optionally facing sideway. A typical installation will have the Zero-U Open-Rack PDU installed at the back of the rack.